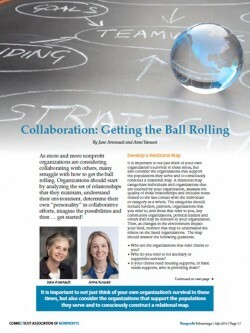 When the CT Association of Nonprofits asked us to write an article on nonprofit collaboration, we asked, “Where do you your nonprofit members seem to struggle with collaborative efforts?”. The response was that everyone is talking about about collaboration, collaboration, collaboration…but some nonprofit leaders struggle with how to just get started. Based on our firm’s deep experience in supporting collaborative efforts among large groups of nonprofits, we crafted an article which provides an initial roadmap for organizations interested in creating collaborative relationships. If you would like to learn more, you can read the full article here. If you are interested in learning more about how Fio Partners can support collaborative efforts, contact us or learn more about our services.